At 21 years of age, most young adults are uncertain of what their future holds. The strawweight, who carries an unblemished record of 5-0, made her Invicta Fighting Championships debut in September and bested Ashley Cummins by decision. That experience was a life-changing event for the fighter. 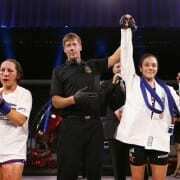 Success in her first Invicta appearance, along with her early career triumphs, prompted Grasso to re-evaluate her career path. Once her mind was clear regarding her fighting career, Grasso took things a step further. Instead of balancing homework with training sessions, the Lobo Gym product now finds herself following the same path many of her family members have already gone down inside the boxing ring. So why did Grasso choose to blaze her own trail in the cage instead of the ring? “Boxing is great and I love it, but I think it makes me a very complete fighter to use my whole body to finish my fights compared to only my fists,” said the Guadalajara-based fighter. Under the tutelage of her uncle and father, Grasso has compiled a record that includes three sub-minute knockouts. She’ll return to action at Invicta FC 10 on Friday, Dec. 5, in Houston. Across the cage will be native Texan Alida Gray, who also possesses three career wins with her fists. 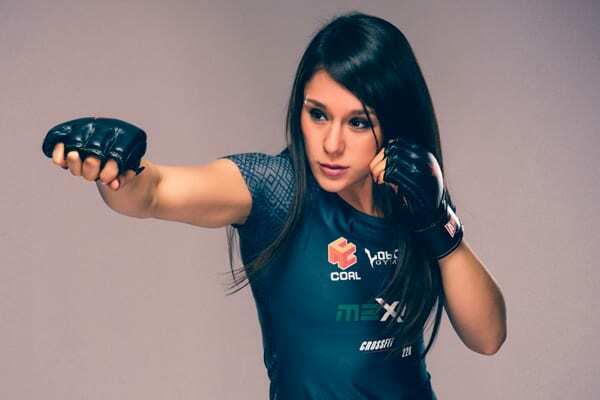 Although Grasso is still very young, she and her Lobo Gym teammate, bantamweight Irene Aldana, are already captivating Mexican fight fans with their talent. The pair both scored wins at Invicta FC 8 and will look to do so again in Houston. “It was a very big achievement for both of us,” recalled Grasso of their September victories. “It was very important because we showed that there are also good-quality fighters in Mexico. If Grasso is able to get past Gray on Dec. 5, her perfect record will undoubtedly land her in title talk at 115 pounds. “As a fighter, I should be ready for any opportunity that comes my way,” she declared. “So if I have the opportunity to fight for a title, it’s something I cannot let go. With her country and her family in her corner, Grasso’s hopes for victory—and one day a championship belt—may soon be a reality. Alexa would like to thank her coaches, Francisco Grasso and Tito Castro, for making her a great person inside and outside the cage, her teammates who have sweated every day with her, her sponsors for taking care of her health and always supporting her, and finally, her dad, who has been living this dream by her side.